The AHC was originally founded in 2005 as a Disaster Management organization to help a few states on the East Coast plan and coordinate regionally for large scale threats, disaster, accidents and incidents. Super Storm SANDY changed everything in 2012. Post SANDY, the AHC became a "liaison" partner with government and began working with the private sector in addressing their long-standing operational issues with disaster preparedness, response and recovery within the "life line sectors" of electric, food, fuel, telecom, finance, transportation, medical and supply chain sectors. Today, with over 16,000 stakeholders nationwide, the AHC and facilitates a trust framework where a number of public and private sector working groups convene meetings, initiate projects, capture public/private funding, develop partnerships and create sector focused solutions that focus on enhancing "information sharing" during any type of incident at the multi-state level. The private sector operates the AHC's Multi-State Fleet Response Working Group (FRWG), a national group of companies and states that focus on solving a long list of operational issues related to transportation, weather, acquiring disaster documentation from government, meeting compliance/legal requirements, locating disaster resources, and sensitive information sharing. State, local and federal government operational professionals advise the FRWG along the way and support the joint development of solutions, planning/exercises, leveraging information/projects/investments, conducting research, and working towards a operational unity of effort during regional disasters. Decision makers in industry and government all claim they need the same thing during a disaster....better, more organized data.... faster. Speed and accuracy of information is critical in order to assess a situation and make critical decision in 30 seconds. 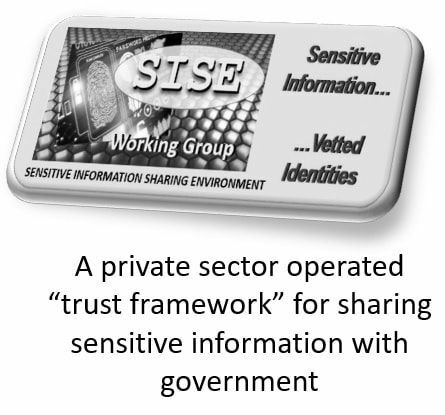 To support this, the FRWG formed a working group of states and companies to work with DHS Science & Technology and DHS Infrastructure Protection develop the SISE (Sensitive Information Sharing Environment) a "trust framework" for information sharing operated by the All Hazards Consortium and its partners from government and industry for the purpose of sharing sensitive operational information before, during and after storms, disasters and disruptions of any kind. The SISE integrates legal agreements, policies, processes, standards and technology together into a single platform that forms the trust framework and provides the bedrock to build solution upon in the future. The SISE is managed by the private sector and shared with government for collaboration and decision making needs. The SISE's provides vetted users access to a disaster apps store that hosts dozens of disaster management apps designed to aggregate and centralize information, organize it into simple usable apps, and provide public and private sector decision makers with tools and data that dramatically enhanced situational awareness, common operating pictures, and decision support. A New Disaster "Apps Store"
As operational problems are identified during a disaster, the FRWG develops a use case template to fix it. By developing short-, mid-, and long-terms solutions for each problem, the FRWG stakeholders quickly work together to locate existing solutions (e.g. research, apps, solutions, processes, training, and data sets) that can be tested during exercises and/or live events. A service will be available in 2017 called 1StopOps... which will serve as a one-stop-shop for unique disaster response apps and solutions jointly developed by government and industry working together within the SISE framework. 1StopOps will feature a simple, three tiered access annual subscription model to serve the beginner, intermediate and advanced users with their disaster management information, planning and exercise needs. The AHC's working groups and their partners across government, academia and the private sector are working together to develop a new approach....Disaster Management 2.0..... that builds upon the proven principles and lessons learned in the past, but moves towards a more data driven decision making environment to address many of the repetitive decision that have to be made during every disaster, free us up to address the unique issues of the present disaster.